Just bouncing by to let you all know we DID already see the Update in the App Market (Google Play on my device) and YES… I AM squealing!!! Now before you panic… NO … there is NOT an update for the actual Event just yet, but a cool look at things to come. Now just for fun.. Can YOU name all the Characters and their Star Trek Counterparts? 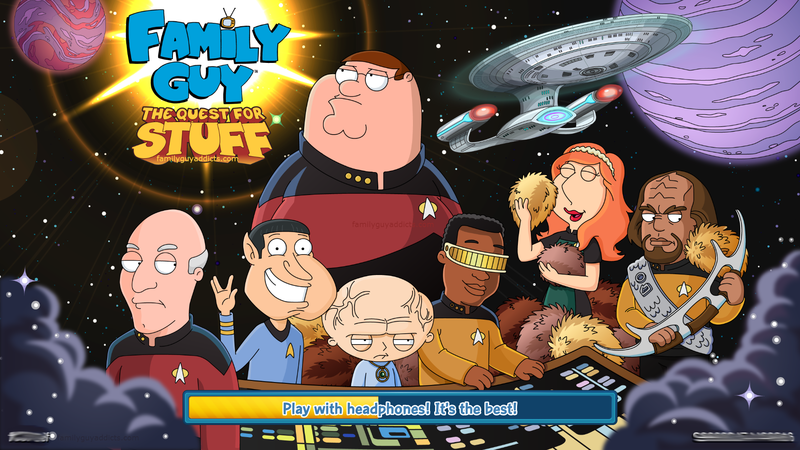 This entry was posted in Game Play and tagged Boldly Go Where No Peter Has Gone, Family Guy Addicts The Quest For Stuff, Family Guy Star Trek Event, Family Guy Tips and Tricks, Star Trek Game, Star Trek Splash Screen. Bookmark the permalink. They should have had Harry Mudd in the game to sell Tribbles- like in the original episode. Obviously you gals are pretty busy today but when you get some down time could you maybe put up a post explaining to us non trekkies what the heck is going on lol. I would love to understand where these things are coming from. What the heck is a tribble?! A fuzzy yellow or brown blob?! Think of Tribbles as the “gremlins” or if you will of outer space. Don’t feed them the wrong stuff or they multiply and do not stop till you are buried in furballs to your eyeballs. Lol. They come in Yellow, Beige, and Brown. Part of a few Star Trek episodes. Lol thanks for the tribble explanation. Don’t need to know all 40 years 6 shows and 12 movies worth! Just interested in where the people/things come from that Tiny chooses to add to our game. Happy to direct you on each item. I will work on a more basic post to help those not involved in the Star Trek world? I think many addicts such as myself would appreciate that. Tribbles were once a feared enemy of the Klingon empire as well. If we all read the in-game FAQ it will save our intrepid mods time for bringing us walkthroughs, etc. Just tap the event icon then the question mark. Can’t get in to play the normal game let alone look at any thing else. Love the new space banner! Whoever designed it did an awesome job! So, my quests just started, but for some reason the Fine Arts District is gone? My buildings are still there, but the land is full of trees again. ITS GAME ON, Keep Clam and BEAM ME UP! I just loaded my game and Star Trek is LIVE!!!! Had to put it on pause so I could share the news! OMG! I just noticed the Al Harrington’s and that circular stage below the Holodeck, could that be for Bonnie to do her pole dance? Just a thought here while we all wait. And I’m not complaining at all. 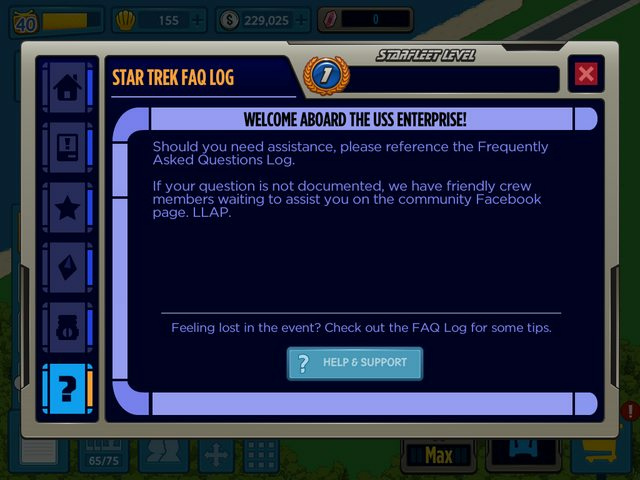 With the television and advertising push for the event going on, I can’t help to think that any new players might be thinking “what Star Trek Stuff?” When they open the game. It would have been neat to see a countdown timer in the game to show when it was coming. yes, it would help. I am not going to stay up much longer …if its not out within next 30min I m off to bed. Ok … I JUST unlocked Olivia and my fab 5 are STILL collecting plutonium, there is one in there already. I am assuming that we will need more plutonium for THIS event? I looked at the picture on the Play Store’s page and those briefcases sure do look a lot like that! Well, I think I’m not going to engage that time travel quest… I have a sneaking suspicion that those are one in the same which would effectively put me ahead of the game. Added to the fact that both Connie and Tricia were enabled to drop right around the time that the Star Trek announcement hit. It just makes sense. I see a lot of comments saying Troi for Lois, Troi had dark hair. Beverly Crusher makes way more sense. Hair color and uniform color fit. Crusher never wore a skirted uniform, though. 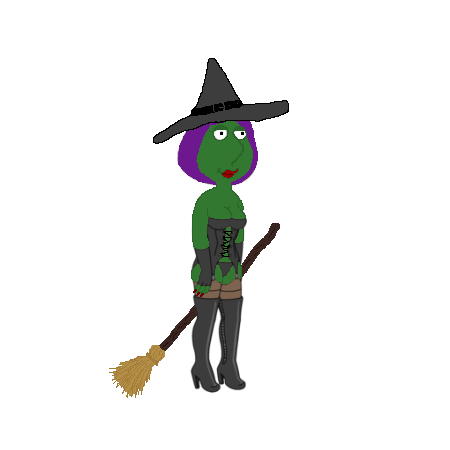 That was Troi in Season 1 or 2. Both wore blue also. Only Troi had a hairband like Lois. That’s true. I just think it’s weird they wouldn’t change her hair color, they have in the past. My only question is, Why don’t the make BONNIE be Deanna Troi and Lois Dr. Beverly Crusher? They could do both. Like when they introduced Stripper Bonnie. I am surprised they are doing Star Trek before they are doing Star Wars….something something Dark Side. I am updated and ready to begin. Now George Tekai and Patrick Stewart better have a big role in this event. 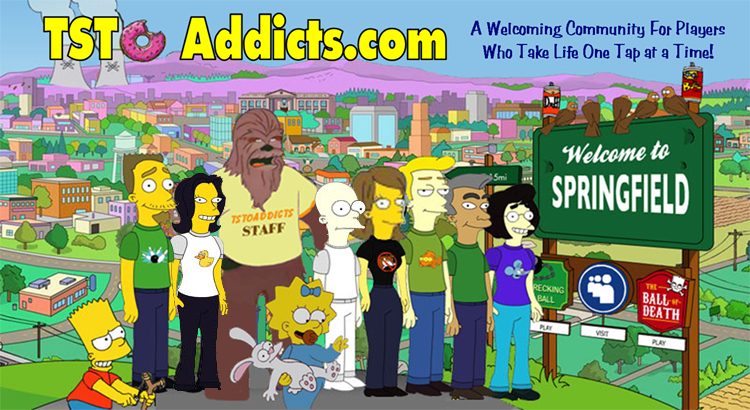 When family guy done its Star Wars eps – the rights for SW were with fox still , since Disney now own the rights to the SW franchise , the chances of there being a SW event here is now slim to impossible – do you really think Disney would want its new cash cow linked to something not child friendly like family guy . While Disney now owns the rights to the Star Wars universe and all future films going forward, 20th Century Fox has retained the rights to the first six movies. The original film, Star Wars Episode IV: A New Hope, is theirs forever, and they’ll own the final five films, Episodes I-III, V and VI, through May 2020. When does this event start? Are you not able to tell what time it will start due to either a promise you made and/or legal concerns? Just curious. I read another time elsewhere (not the 18:00 PST). But I won’t say to avoid spoilers and you probably can’t confirm it anyway. 😉 I’ll just wait and see. Ohhhhhhhh……. can’t wait can’t wait…..open open open open….they did say Thursday right? And it is Thursday right? I already told my gf if I have to pay for Levar, I will, even tho she banned me from buying anything on FGQS. Nice collection but what’s with the monkey? I think it’s planted in there as a ‘wishful thought’ that we may get the Evil monkey. A Freudian slip if you will. Wow this looks really awesome looks like we goin inside the enterprise n having a whole lot of new things to interact with n new ways to play the game this event will most definitely b different n a whole lot better then the past events gud job tiny co! Im hoping some of the never used characters FINALLY get their shot. Is it just me or is the shoreline beach broke at the corner? Just updated the game and noticed the glitch(or is it?). Look at that collection, what a nerd …. 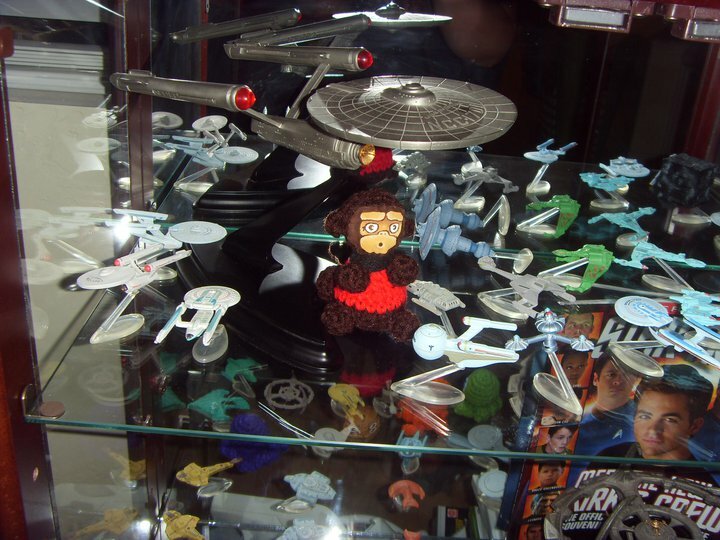 oh wait … I have those same MicroMachine star ships … silly me! Will there be a joint task where Stewie takes them all to McDonald’s so Michael Dorn can get a McDLT? and I just can’t hide it……. Bring on Star Trek, Where we can all BOLDLY GO WHERE NO GLITCH HAS GONE BEFORE. The app doesn’t close properly since update with music still in background. Force closing means I lose any progress made. Should shouldn’t lose any progress if you hard close. It’ll just reload your game. It would be nice if they gave us more info during these updates. Something like, “This app update allows you to get the new content WHEN WE RELEASE IT.” That way we’re not scratching our heads as to what to do next or when to start the new story line. They get us all excited about the update but don’t tell us when the new content is coming! Agreed. If the content isn’t live with the download it should say so. Not everyone who plays checks the TinyCo site or this one. Part of me feels that this gane is getting way to complex for a free to play game that should take no brainpower to play. Hey I have a bunch of those same toys man do I miss micro machines!!! I liked you all on facebook why the hell is that stupid box still in the corner? Well…we’re not TinyCo, so I can’t speak for them with the facebook link in their game. Probably already been said but cant contain nerdiness atm. for your ships- USS Enterprise ( Original, A, B, C?, D, E visable, if NX-01 there i cant see it). Several Excelesior class. Several Miranda class (Khaaaan). I see a DS9 model on bottom. Science/medical vessel. USS Defiant on bottom, near Galor-class Cardassian ship. A couple of D’Derix class Romulan War Birds. A Runabout near your monkey. Several Kirk era Klingons. Several DS9-esque Klingon Bird of Preys, and 2 Vor’Cha class Kilngon Crusiers. I think i also see a Ferengi ship on bottom shelf right of the Defient. Think that covers most of it. Can’t tell who Lois is supposed to be. Is she Dr. Crusher or Troi? Or someone else? just with red hair, and no resemblence to her hair style, and god I am old. Nope, it’s either Dr. Beverly Crusher or Deanna Troi. The green uniform and red hair could be Dr. Crusher, but the hairband says Councillor Deanna Troi. Yeoman Rand wore a Red Starfleet uniform. Is it sad that I have set alarms every two hours throughout the night (its almost 9pm here) just to make sure I get as much time as possible playing? Throw the alarm clock out the window. Wake up 8 hours later. Repeat until you complete the event.